For a while now, I've been contemplating steering this blog of mine in a bit of a new direction. As with many blogs, it's been a little more quiet over in this little little corner of the internet over the summer, and I've really relished having a little break from it all. Don't get me wrong, I've really missed the regular writing and taking photos (although of course, I have been over on Instagram daily with my posts there or on my Insta Stories over summer). But I've enjoyed a little break and it's given me a bit of time to take a step back and have a think about where I want to take it. If you follow me on Instagram, you may have noticed that I've been featuring in those little squares a little more often than I ever used to. Most of my photos used to be of LO, and then of LO or Little L or both boys together, but in recent months, I have made that step to get in the frame a little more, rather than be the one hiding behind the camera all the time. Whether or not this was a conscious decision I'm not sure, but it made me think about the amount I put on of the boys, particularly LO, now he's at school. I then started to think about where I want to take my blog. It is of course a parenting blog, but I also write about lots of other things too, from lifestyle and interiors, to days out and the occasional travel posts too. I am definitely going to get more time to indulge in more of my own interests and I'd love to share some of these on here, besides the usual parenting and family stuff I like to write about. And so I wanted to do a post all about my Little Loves- it's a link hosted by Morgana at Coffee Work Sleep Repeat. I used to join in occasionally, and as with most things, I would forget to document and photograph things I'd been loving that week, and so stopped joining in. But I love reading other people's #LittleLoves posts, especially Jenny's from Let's Talk Mommy, whose posts are just so beautiful and full of inspiring ideas which she shares. I wanted to share a few of my Little Loves not just from the past week, but from over summer, and then in following weeks I'll be organised and share my #LittleLoves from that week. I hope you enjoy reading, and as always, do leave me a comment about what you've been loving lately. I always love to hear from you and love hearing about new and exciting things I might like. This emotional and heartfelt post by the lovely Esther from Inside Out and About. I have been talking to Esther for a couple of years now and got to meet her at Britmums last year. She is such a lovely genuine person, and I have loved reading her blog and following her beautiful Instagram for a while now. I was so sad to read that she is waving goodbye to blogging for the foreseeable future, but I wish her every happiness and hope she enjoys her new found passions and hobbies. 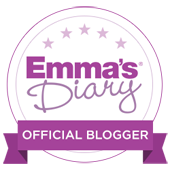 Katie's blog Mummy Daddy Me needs no introduction I'm sure, but her blog has always been one of my absolute favourites and I will always check in to see if she's done a new blog post or video. Like me, she has recently moved house and has been doing lots of house renovations and room makeovers. I loved reading all about how she's organised her girls' new wardrobe system. It's definitely inspired me to try and get a bit more organised with our own storage around our house, plus her ice cream inspired decor is just to die for. This week Richard and I had the honour of watching our friend get married over in the beautiful Derbyshire Dales. We've known each other since we were 9 and it was wonderful to see her get married. It really was the most beautiful day and the venue was Instagram heaven- I was bowled over by the level of detail she went to with planning the style and decor of the day. Bar the usual family dinners, I haven't made or anything overly exciting this past week, what with starting the new school routine last week and having work done in the house this week. So I'm cheating a little here- we made the school run for the first time last week and LO made it through his first full week at school. I am so incredibly proud of him for how well he's taken to it, with no fuss or tears. I wish I could take things in my stride like that. We live four doors down from the school so this school run is the shortest ever, but I do love our new little morning and afternoon routine, and I feel incredibly thankful that we can walk to school hand in hand together. I am hoping to do a few more style posts in the future, and may feature a few things I've been loving wearing on here, but for now, it's all about the raincoats. The weather lately has been so up and down, sunny one minute, rainy and cold the next. But what better excuse to dress Little L in a bright yellow rain mac. I've had a lot of questions about this one, which I picked up in George for £12. Over summer I started up again on a bit of a fitness mission. I have been going running in the evenings a few times a week and I am really enjoying it, much more than I ever thought I would. I've found that because the land is flat here, it's so much easier than when I used to run up and down hills constantly in Yorkshire. I am also finding that listening to music really helps and encourages me to run faster and further too. I absolutely love this version of Another Love by Tom Odell. It's been a little quiet over in my little corner of the internet lately, but I am hoping to get back into the swing of blogging. I am hoping to attend Britmums at the end of September, and I'm sure that'll give me the inspiration boost I need. If you're also going, do let me know, I'd love to see you! Oh thanks for the mention darling and you always do amazing things and it's great to evolve and change with our blogs as time goes by and readers will appreciate and go along with you as they change and adapt too. It keeps the interest flowing too. I can't wait to see what you do next. And joining in the #littleloves gang too more. So lovely to have you joining in with Little Loves again. I too made a content change when my girls started school and I'm so pleased that I did. We love a yellow mac here too. Both my girls and I have them, we must look a right picture doing the school run all matching... cringe!! Well done for getting back on track fitness wise, it's so hard juggling everything and finding time for ourselves isn't it?